Yes, the most famous split infinitive in the world and possibly the four greatest examples of pure Tarot Kings 😉 Who’s who?! First Officer Spock – Logic is his keyword and, literally, his mantra. Cool and unflappable because of his lack of emotional response, Spock makes a fine King of Swords. However, when the emotional, half-human side of him surfaces …. that’s when things really start to get interesting around Spock. Captain James T Kirk – I. Am. Resisting. The. Desire. To Type. Like. Kirk. Talks. Passionate, charming, a hit with the ladies, usually shot in soft focus, Kirk is a brave and magnetic leader. He leads from the front and would do anything to save his ship and his crew. Except for those guys in the red sweaters that died every episode. Kirk has got that Wands drive to ‘explore, seek out new civilisations’ and all that. He’s not so bothered about the fine detail. He issues the commands and other people ‘to make it so’. He is our King of Wands. Doctor McCoy is the Healer on the starship Enterprise. Often caught in the middle of the impassioned Kirk and the calculating Spock, McCoy is usually found remonstrating with both of them – diplomatic and caring, McCoy and his amazing toolkit of healing things that make peeping noises is our King of Cups. Chief Engineer ‘Scotty’ is the only guy in a red sweater not to die. Also the only one who is brave enough to try a Scottish accent for all the episodes. He’s the Enterprise’s mechanical genius. Despite protestations that ‘she canny take it’, Scotty always ensures that she can and the Enterprise (and her team) live to fight another day. Practical and resiliant, he is our King of Pentacles. And I could not resist this….. I think the Queen of Wands would want me to adopt this as a mantra! All credit for the subject of this blogpost to Vivianne Kacal! I have always used Kirk as my trigger for King of Wands, but I never thought of the others before. Cool! It was Vivs suggestion for the 4 of them – and much to fantastic to pass up! 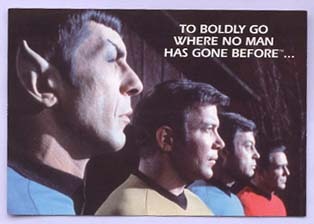 This is SO eerie, as I was just watching the re-mastered Star Trek episodes, with the cool new special effects. space scenes, CGI, etc. Talk about synchonicities! I think Arwen is right on with her analysis. Maybe the Queen of Pentacles is the Enterprize herself! Arwen – you're a real Trekky! I never knew that Nurse Chapel was Gene Rodenberry's wife!!! Marvellous! I'd never thought of the fab four like that, but it's so true!!! Arwen really got into the swing of it lol! My friend Viv suggested that they would be good for the Four Kings – and it was soooo perfect I had to do it!!! Spock, of course, is our King of Swords. It's only logical. Jim Kirk is.our.King.of.Wands. He's passion personified. Bones, my darling Bones, would be the healing King of Cups. And of course Mr. Scott is the practical King of Pentacles. But let's go on from there! Uhuru is the Queen of Swords in her role as communications officer. Nurse Chapel — the Queen of Cups. Yeoman Randall (I think that's her name) is a good match as the Queen of Wands, but who is the Queen of Pentacles in the old crew? And what about the other generations? Arwen – you really ran with this lol! 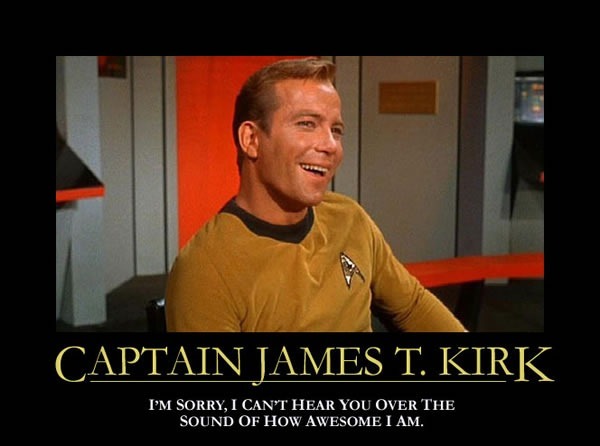 I looooooove your way of showing how Kirk speaks – brilliant! And those associations for the junior officers – Chekov and Sulu what about them? !